This Two Cats handpainted needlepoint design is by the artist Two Dog Dezigns. The design measures 9" x 15". If you want to keep your canvas taut, you should use one pair of 13" and one pair of 19" stretcher bars and some thumb tacks. 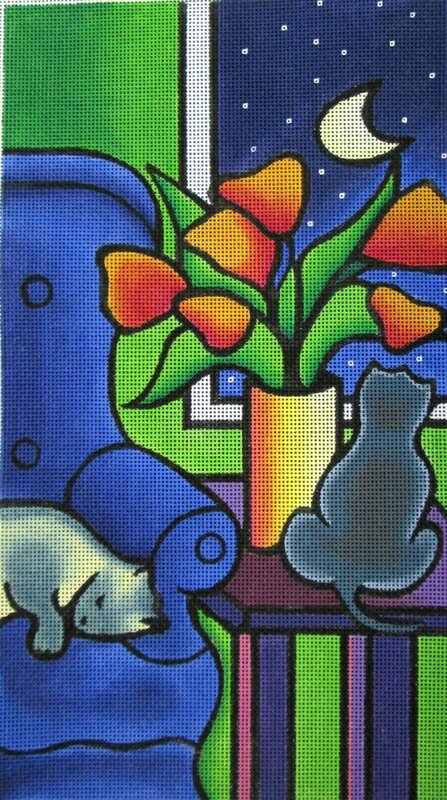 This Two Cats handpainted needlepoint design can be purchased canvas-only or as a kit. If you order a kit with wool or silk yarns it will come with Planet Earth boutique fibers. If you order it with cotton fibers it will come with DMC embroidery floss.